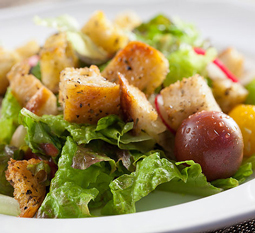 Tuscan Croutons - A recipe from Savor California, the online showcase for extraordinary gourmet foods and beverages from California. To get the bread to soak up the oil and herbs, day-old bread works best. if you are using fresh bread, dry it out in the oven on warm before you add the oil and herbs. Allow it to cool. Break up the sourdough bread into bite-size pieces, toss it with Extra Virgin Olive Oil and a little Tuscan Temptation. Bake at 375 degrees for 15-20 minutes, depending on how crisp you like them.